There’s nothing cuter than a dog who gives it’s owner a High-Five on request. The perfect team needs the perfect celebratory gesture and with this guide, you’ll be mastering the command in no time. Start by gathering your dogs attention either with the cue of his name, or by letting him smell the treat in your hand to attract his interest. When he’s engaged, get your dog to first Sit, then with your free hand, slowly pick up and hold his paw, like a hand shake but without shaking his paw. Use the phrase ‘Paw’ or ‘High-Five!’ when you do so. Drop his paw and remove immediately. Repeat the above steps numerous times until your dog is beginning to predict the outcome, and automatically raises his paw in anticipation. Continue working on the trick, repeating the verbal phrase you’ve chosen slowly and calmly. Once you can perform the trick without having to pick up the dog’s paw, and he gives it to you after you’ve given the verbal cue, you’ve successfully taught the trick. 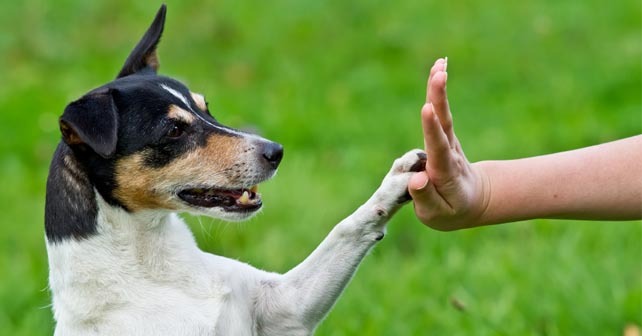 You can gradually work the ‘handshake’ into a high five by moving your palm to face your dog. As long as he touches your outstretched hand with his paw, the trick has been completed. Keep the training sessions short and sweet, twenty minutes a day focusing on one trick at a time is all that’s needed.